When horses meet for the first time (or after separation) they will exchange exhalations through their nostrils. 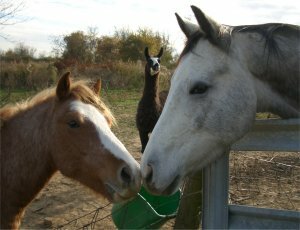 This is how horses say "hello", they will remember each other's breath like we recall names. After a few initial breaths, the intensity of the "huffing" will then increase or decrease depending on the information exchanged. Increased, harder breathing in the desire to work out dominance, and can lead to biting, squealing, striking or turning around to pummel with hard kicks from hind legs. For these reasons, its not a good idea to allow them to exchange breaths while riding them! Horses that have already exchanged breaths may just go about there business grassing, grooming or standing next to one another.